Our BIGGEST Sale of the Year Starts TOMORROW! There are very few people who can actually say they love what they do. We can honestly say we LOVE our jobs. Everyone knows how excited we get every time an order is dropped off… like kids on Christmas morning! The Paper Pickle has brought so much happiness to our lives. We have reached many goals we never imagined we’d achieve because of you, our loyal customers. You stop in and support us, but not only that, you tell your friends about us! Even after six years, we continue to meet new people every day who are getting started in this hobby that brings us all so much joy. We are always so flattered when people make special trips to Chatham to come visit us! But, as our lives continue to change, we too must change. Our priorities are now shifting as we watch Julia, Coulter and William grow. Our lives will only continue to get busier as our families keep growing; therefore we have decided to put The Paper Pickle Company on the market for sale. This has been the most amazing six years of our lives! We have grown tremendously; from our humble 400 square foot store on Kent Street, that focused primarily on renting stamps, to our expansion only 17 short months later to our current 1,200 square foot location, with the addition of scrapbooking supplies and an invitation business. Not only have we built our business over the years, we have built many amazing friendships. We have been included in your growth both personally and creatively. You may have come into the store because you wanted to scrapbook your child’s life or your life. Maybe you were getting married and wanted to create unique invitations or you wanted to make a special card for a friend. But you have all come in because of the love of the hobby. We have had so much fun watching life happen. 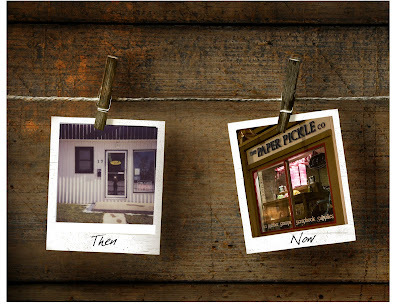 And you have seen life happen at “The Pickle”. Kell got married and had her first child, and Kim joined the business full time in 2005 and raised her two children at the store. So what does this mean to you? Well, behind the scenes, we are going to work to find the best purchaser so that the integrity of the Paper Pickle remains intact. We want to make sure that this person comes in with the same excitement and passion as we do. We will guarantee that you will not notice a change in the day to day operations of the business. We will continue to provide you with the latest and greatest products at competitive prices (did I mention that copic markers will be here any day now and that CHA orders are now being placed?). We will also continue to provide you with our amazing customer service. The best thing that you can do to ensure that The Paper Pickle remains as it is today, is to talk to us if you would like to be included in the future of the business or pass this post on to someone you know that may be interested in this great opportunity. That's right. 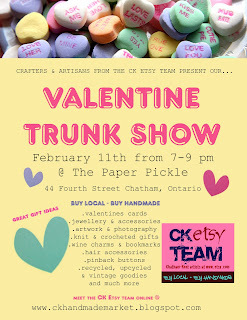 We had so much fun in December, that we decided to pair up once again with the Chatham-Kent Etsy Team! Mark your calendars for February 11th from 7-9PM. There will be many new and returning team members (over 12 confirmed) which means many new and exciting goodies for your dill-ightful valentine! It will be the perfect night to come out and buy a little something for your sweetie PLUS make a little valentine for that special someone. Be sure to come out and support these extremely talented, (and did I mention local? ), artisan's in the comfort of your favourite store (*smile*). Our 6th Anniversary Sale has been going for 4 days strong but as you know, all good things must come to an end. Don't miss out! Tomorrow is the last day to save on some pretty amazing deals. The last day of the sale is Saturday, January 30th! Store Hours are 10AM-3PM. Hope to see you there! 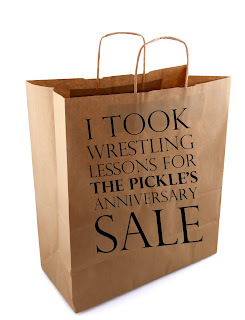 Just wanted to send a quick note to remind you that THE PAPER PICKLE CO. 6th Anniversary sale starts TOMORROW at 10AM! We have been busy preparing over the last week (Did you get a peek of the boxes of goodies behind the counter all sale priced and ready to go?). Let's just say, you will NOT be disappointed with this sale! ♥ Selected Cuttlebug folders and Spellbinders dies priced to clear! Bring a friend....let's make room for all the NEW CHA items!! Remember to shop early and often as we LOVE to add new items to our clearance tables throughout the week! There are going to be TONS of delicious and dill-ightful product on sale! As many of you know, we like to add different items each day to our amazing sales tables. So the best thing to do is to shop early and often! So what exactly is on sale you ask? Let's just say, it could be anything BUT the bike! We could never part with this girl. 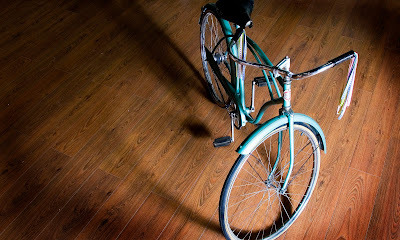 Have you guys ever wondered about this bike....why we always have her in the store? She turned into our mascot when we moved the store from Kent Street to Fourth Street. I spotted her at the end of some one's driveway for $40. I thought she would be a perfect accent for our shabby-chic store. I told the gentleman, who was retired and loved to fix bikes in his spare time, that she was going to be a prop for our front window. He thought that was fine, but insisted that I take her for a ride before I paid. I agreed that she was a nice ride and gave him a bundle of fresh asparagus, that I had just purchased at Boley Farms, to hold the bike while I ran to get enough money. And she has been in our store ever since. We have had many offers but we will never let her out of our sight. The gentleman that sold me the bike, still stops in periodically to say hello and even pump up her tires! I spent the better half of my weekend drooling over all the new and amazing product being released at the Craft and Hobby Associations (CHA) winter show in Anaheim, California. I have pre-ordered from a couple of companies already. Check out this great site to see for yourself how great the new lines are....http://www.aussiescrapbooking.com.au/cha-winter-2010-sneak-peeks/ (thanks Alison!). We still have a couple of spots left in Debbie's class tomorrow night (Wednesday, January 20th). Give me a call if you can make it! I guess people did not receive the Feedblitz notification so I will resend this. Sorry for the confusion. Great cards for any occasions including birthdays, thank yous or anniversaries. Pauline will show you how those little "extra" touches like dimensional items or embossing can go a long way. Check out these great cards by Linda. Work with Spellbinder's Impressabilities and create a beautiful letterpress-type card. In the second card, let Linda show you how easy it is to make gorgeous sunsets using staz on ink and background stamps. Looking to find fun ways to use your supplies for things other than cards or layouts? Debbie will show you just how easy (AND fun) it is to make these little projects. You will work with the Scor-pal throughout the class to make items including: a One sheet box, a gift box and a gift card holder. You will also stamp, work with punches, ribbon and more. As usual, advanced payment is required to save a spot in the class (must be paid within 48 hours of booking). Please call to sign up (DO NOT use email!). We look forward to seeing you in class! I would like to say sorry to all the scrapbookers out there. You will notice that there are no scrapbooking projects for January but you are in for a special treat starting in February. We will have a NEW 12x12 layout girl! We will be offering regular, monthly classes! I am still in the process of working out the details so I will leave you in a little suspense for JUST a little longer (I promise!). These layouts will be well worth the wait. Honestly, I feel like I have been on a roll over the last couple of weeks and that makes me happy (*wink*). And I owe it all to great product (Basics Grey's Origin line) and amazing photographers (Fairytales Photography located here in Chatham). My last post was a little mini album. That worked out so well that I decided to see if Basic Grey's premier scrapbooking layout kit held up to the test. I am a huge fan of their card kits. They are just too fun....8 fun cards with no thinking required! What more do you want after a hard day at work? You feel like you really accomplished something without having to strain your brain. I don't know about you but it normally takes me 2 hours to pull together a card from thinking of what stamps to use to which papers will look best...and this is on a GOOD day! Honestly, their scrapbooking kits were JUST as much fun as the card kits! You get everything you need in the kit to make 2 one-page layouts and 1 two-page layout AND there were tons of extra goodies thrown in (ie. chipboard flowers, butterflies, rub-ons, die-cuts). And look how great they turned out!! I really tried to stick to the layouts provided, as they were all so cool. Did I mention that instructions are provided and all pieces are labeled....this kit really was made for dummies (me included!). The only thing I did add was the Live, laugh, Love stamp by Unity, as I didn't have a photo that fit well in that spot. I had one pro scrapbooker ask the other day if the pieces were all pre-printed on the 12x12 pages (ie. all the smaller pattern papers you see) and the answer was no. So you have the flexibility of moving the various papers or omitting them if you like. It is nice to have that option if you are feeling creative. Just in case you are wondering, these kits are available in store for $21.99 (just $5.50 per page)! Not bad work for a Sunday night if I do say so myself! PS...The class schedule will come out tomorrow! I know what you are thinking....yeah right! No one EVER sticks to their New Year's Resolutions. But I think I have finally found one that everyone should make AND can stick to. My resolution is to do things that make me happy. Vague, yes but at the same time all encompassing. And with almost a whole day of 2010 under my belt I think I have stuck with my promise to myself. Take a look at this project I worked on today. It is Kaiser Craft's 2009 album. I worked entirely with Basic Grey's latest line called Origins, a few strands of twine, some rub-ons & metal embellishments and VOILA....something that make me happy! This project just makes me smile. These were our very first professional family photos. BJ & Melanie of Fairytales Photography did the most amazing job. Their style is very rustic, vintage-y and well...me. I'm sure you will be seeing many more projects from this session! Projects like this make me happy because they take no time to complete. The album is 6.5x6.5 and has a total of 8 pages and can very easily be completed in a few hours. And what makes life easy is when you work with collection packs. As mentioned, I used the Origins collection. There are 18 double sided papers, a sheet of alphabet stickers and sticker embellishments. Pair this with their chipboard embellishment stickers (sold separately) and you're laughing! What do you guys think of the colours of this collection? Yellows, greens, black AND browns. Yes, the colour palette is kind of all over the place but it just works. Don't be afraid to different colour combinations like this on your pages or cards. The teachers are busy working on their projects for the upcoming classes. We will resume classes around the middle of the month.